May is prime time for the climbing routes of Mt. Everest, where mountaineers from around the globe make the grueling ascent up the 8,848 meter (29,029 feet) peak in Himalayan Nepal’s wild northeast. 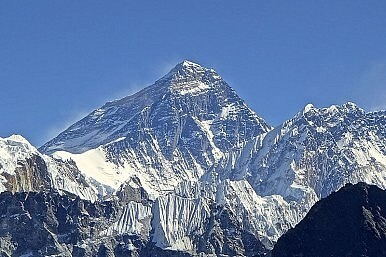 According to Kathmandu-based American chronicler of Himalayan climbing lore, Elizabeth Hawley (aka the “Grand Dame of Everest statistics”), Everest’s summit was reached 537 times in 2011 – 371 from the south and 166 from the north side – by 525 different climbers. As of that time, Hawley estimates, about 3,425 people had reached the summit a total of 5,652 times since New Zealander Edmund Hillary and Sherpa Tenzing Norgay made the first successful ascent in 1953. The climb is not to be taken lightly. As of 2011, 223 people have died on the mountain. So far this climbing season there have already been four confirmed deaths – two (one Sherpa, one climber) from cardiac/cerebral events, and another two Sherpa who slipped – one into a crevasse and another on the Lhotse Face. The dangers that claim lives on Everest are many, including rockfalls, avalanches and some of the most extreme weather patterns on Earth. And plans often go astray on Everest. Starting at Base Camp – which is a feat in itself to reach at 5,400 meter (17,700 feet) – climbers acclimatize for a few weeks while Sherpa guides prepare the way for the next step. Expeditions then make their way up through the unpredictable Khumbu Icefall, which they navigate using ropes and ladders prepared by Sherpa guides. The Khumbu Icefall is host to numerous perils: seracs (ice columns), crevasses and shifting chunks of ice for a start. Climbers generally tackle this death-defying stretch of the ascent before dawn when frigid temperatures hold the ice in place. After making it over the icefall, the next stop is Camp 1 (aka the “Valley of Silence”), described as a “vast, flat area of endless snow, deep crevasses and mountain walls frequently washed by avalanches.” From Camp 1, they continue on to Camp 2 (6,400 meters, 21,000 feet), Camp 3 (aka Lhotse wall; 6,800-8,000 meters/22,300 feet – 26,300 feet), and then Camp 4 (“the Deathzone”), where the atmosphere literally peters out and creates a near lunar landscape under an eerily blue sky. From there, those who can trudge on to the summit – via a very exposed route that includes the infamous Hilary Step, the one part of the climb that does require some technical skills. Alongside waiting for the right time, Salisbury points out another key step taken to minimize the formidable risks that come with climbing in the Himalayas. “Most commercial outfitters now assign individual guides or Sherpas to each client to compensate for this,” he said. The Sherpa people, Himalayan natives of northeastern Nepal, have come to international attention recently following significant media coverage of a fight that broke out between more than 100 incensed Sherpa guides and three European climbers – Ueli Steck of Switzerland, Simone Moro of Italy and British alpine photographer Jonathan Griffith – at 24,000 feet. While most stories have focused on the roots of the fight itself, the outside world knows little about these intrepid mountain guides – their culture, their lives and pay and the significant role they have played in pioneering the efforts to conquer Earth’s highest peaks. Who are the Sherpa? We’ll consider this question tomorrow. A proposed ladder at the summit, overcrowding and melting glaciers: Mt. Everest is not what it used to be.